Thanks to everyone who donated and purchased items in the Silent Auction. We had a great turn out and couldn't do it without the huge team of Team Vogel supporters and local businesses. 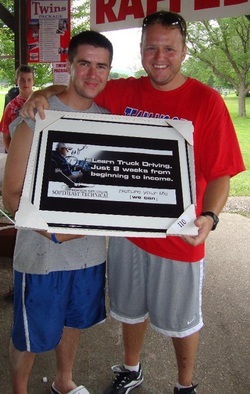 A special thanks to this year's top bidder, Jared Hubbard, on his purchase of the autographed Nick Granseth MSC-ST Truck Driving framed billboard replica. Both Jared and Nick are huge supporters of Team Vogel and we appreciate the humor in this very generous donation! THANK YOU!